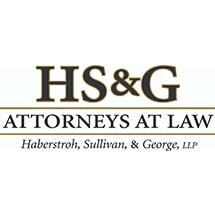 The law firm of Haberstroh, Sullivan, & George, LLP is an experienced and capable law firm that traces its historical roots in the practice of law to the early days of Blair County. The Sullivan and Haberstroh families have had family members practicing in Blair County for over 100 years. In the case of the Sullivan family, it can trace its heritage to John A. Doyle (18__ - 19__). John Doyle was maternal uncle to John F. Sullivan (1874 – 1937) and J. Austin Sullivan (18__ - 1943). John F. Sullivan had a son and namesake, John F. Sullivan (1932 – 2014), who was a proud member of the bar association for over 50 years. John Sullivan was himself the father of two sons who have followed into the legal profession: Shawn P. Sullivan and the Honorable Timothy M. Sullivan. Bill Haberstroh’s family tradition is no less renown. It began with his paternal uncle, John Haberstroh (1894 - 1939), and continued with his father, the Honorable Robert C. Haberstroh (1910 – 1982). From the beginning of the practice of each, every member of the Sullivan and Haberstroh families who has practiced law in Blair County has gained a reputation for excellence in the areas of law in which each practiced. With Terressa George and Brandon Ryan, Haberstroh, Sullivan, & George has expanded the fields of law through which it assists its clients. Whether the client is seeking assistance with custody and support, wants to plan for the transition of his/her business to family members, has questions regarding the best way to dispose of his or estate among children, stepchildren, or other members of an extended family, the firm of Haberstroh, Sullivan, and George is here to assist in these and other legal matters which the client may face. As part of the wisdom which was passed on by our familial forefathers, we consider the recommendation of past clients to prospective clients as the highest honor. Allow us to exhibit why our clients have entrusted their legal problems to us. We welcome the opportunity for our lawyers and support staff to assist you. You are invited to call our offices, conveniently located in Altoona and Martinsburg, to schedule a consultation.